SPARTA, Ky. – So far, this has been a summer Jimmie Johnson would love to forget. His last eight NASCAR Sprint Cup Series races have produced an average finish of 20.75, with the lone highlight a third-place run in the Coca-Cola 600 at Charlotte. That, by the way, was the only top 10 in the last eight races for the six-time series champion. Most recently, his No. 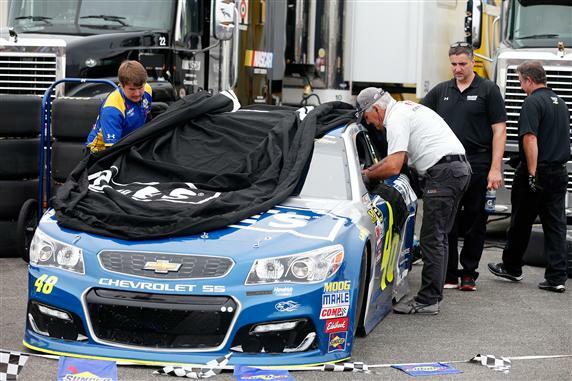 48 Hendrick Motorsports Chevrolet was gobbled up in a 22-car accident last Saturday at Daytona, where Johnson was credited with his second 35th-place finish in the last four races. Sure, Johnson collected two victories in the first five races of the season and locked himself into the Chase for the NASCAR Sprint Cup for the 13th straight season, but as of Daytona, Johnson had fallen to ninth in the series standings. On Friday at Kentucky Speedway, his hopes for a reversal of the recent trend in Saturday’s Quaker State 400 (7:30 p.m. ET on NBCSN) suffered a setback. Early in a morning practice shortened by rain, Johnson slid into the outside wall in Turn 4, evidence that the repaved, reconfigured 1.5-mile track is as tricky as advertised. “I just got wide and evidently the track is dirty wide,” Johnson said. “I didn’t have anything go wrong. I just got wide, and the car just started going straight, and it wouldn’t turn. Johnson’s team rolled out a backup car, which ran eighth fastest in Friday afternoon’s practice session. Even though qualifying for the Quaker State 400 was canceled because of the wet weather, Johnson will start ninth in the Sprint Cup race, with the field ordered according to owner points.